We’re always on the lookout for new ideas that will benefit our retail clients without mimicking trends that everyone else is already doing. Pop-Up Shops seem to be showing up everywhere in the retail space. This particular trend is one that we feel can be differentiated and wildly successful for retailers who use them as a highly effective retail testing platform. Pop-Up Shops are a great idea in today’s retail ecosystem. There is significant empty retail real-estate right now, and landlords are much more willing to take on short-term leases than in the past. Retailers are generally looking to increase overall store traffic and brand affinity. These shops do just that. Pop-Up shops drive brand affinity by creating experiences that strengthen the relationship with each customer. Lesser known brands can use Pop-Up shops to inexpensively break into new markets and establish brand awareness. New digital technologies have the power to enhance the experience and value of your Pop-Up. From shopper data capture for re-marketing to mobile app powered geolocation commerce experiences – digital experiences are powering the modern Pop-Up. With new, modern retail technology platforms and omni-channel commerce systems like Shopify and Square, launching a digitally enabled pop-up is a must for any retailers looking to offer unique customer experiences. Unique, on-brand digital experiences draw in people and capture their attention. Narratives brought to life with motion graphics, touchscreen displays, and VR/AR experiences are good examples. An easy to launch and use POS. This doesn’t need to integrate into your legacy ecommerce or ERP systems – speed and ease of use are key. Ecommerce “activation” within your Pop-Up. Go beyond a transaction – make purchasing a fun and interactive experience. Engaging product demos and unexpectedly convenient shipping options make all the difference. Mobile Loyalty experiences: Consider exclusive geolocation product drops or personalized experiences for customers that are part of your loyalty program. Extend special offers to loyalty members after the Pop-Up to amplify your reach and content. Tie your customer data capture into your Salesforce or Hubspot CRM systems for easy follow up marketing. Speed: Pop-Ups give you localized speed in getting products in customer’s hands that can’t easily be matched by competitors. Nike's “Rio Unlimited” engages visitors with an on-brand digital art installation exuding "the ecstasy of competitive glory." It is extremely important to include your brand promise in a Pop-Up Shop rather than just creating something cool and full of whiz-bang technology. I’ve written about this before, so I won’t go too in-depth here, but there is a tremendous opportunity to craft an experience in a Pop-Up that accentuates and furthers what you stand for as a brand. A Pop-Up that relies only on hot new technology will fail if it does not resonate with your customer. The experiences that are compelling for your customers may or may not include new technology such as AR/VR, Magic Mirrors, Instant Checkout – the list goes on. The technology you choose to use should help you tell your brand story, delight your customer, and create a frictionless purchasing path. These things are essential both within the shop itself and throughout the entire customer journey. A great Pop-Up Shop will engage your guests at each step in their customer journey. Before the shop experience, they need to hear about it, be incentivized to visit, get excited about it, and hopefully share it with their friends and family. These things can happen via your website, your mobile app, social channels, on-and-offline marketing and ideally through some buzz-worthy guerrilla marketing. The Nike’s Maker’s of the Game Pop Up Store during the 2018 All-Star Weekend used their mobile app to tease the Air Jordan “Tinker” exclusive sneaker and dropped them at a specified time and location. Upon finding the shoes, customers used the app to complete the purchase, and share their score with legions of other Nike fans. While in the store we find that customers love two types of technology: Personalized digital experiences, and software/hardware that allows frictionless purchasing. We’re also finding that adding a human element to digital tools can greatly enhance the experience. When you give customers the ability to describe a challenge they are experiencing, and use that challenge to customize a product that will solve their problem before they arrive at the store – you create an unforgettable experience. The digital tools that we’ve built and are currently testing are proving that this method improves customer satisfaction and increases revenue. The ability to purchase things quickly is also crucial while in the shop. Technology can help in this arena. Many clients that we work with have legacy POS or e-Commerce engines that don’t work effectively in a Pop-Up environment. A Pop-Up shop can be a place for retailers to experiment and play with new ideas. Generally, we recommend using off-the-shelf solutions like Square or Masterpass to enable transactions in a Pop-Up rather than shoe-horning enterprise systems into this environment. After shopping it is vital to follow up with customers using loyalty programs, invite them to share the experience, and make it clear how they can return items. Having an established return policy is important. 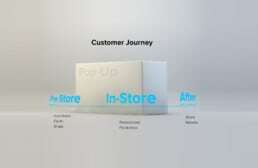 Customers worry that Pop-Up shops will disappear and they will be stuck with what they bought. This can lead them to not make a purchase at all. Giving customers the option to return items easily and free of charge will abate those fears. Speed, in our opinion, is the primary driving force behind innovative disruption in retail. Amazon is faster than almost anyone else at getting things to your doorstep as soon as you buy. However, being physically there is even faster than that. This is a significant reason why two-thirds of millennials shop in stores every week. That said, it’s hard to “be physically there” everywhere, and a Pop-Up Shop can help with that. Interested in testing a new market? Pop-Up. Wondering what would happen if you sold a single product line right down the street from your existing store? Pop-Up. You get the picture. Pop-Ups give you tremendous speed in getting in front of your customers and getting them products. Indochino Pop-Ups epitomize Omni-channel by measuring customers in-store and letting them complete their purchase online. From a technology standpoint, we recommend using software platforms that are API driven. Pop-Ups are prototype testing opportunities, and that includes the software. Luckily, almost all modern systems have APIs that make it easy for POS/e-Commerce/Inventory/Loyalty/etc. to talk to each other. If you’re thinking that what I just described sounds a lot like the golden goose that we’re all striving for – omnichannel – you’re right! A Pop-Up is a fantastic place to test omnichannel experiences outside of what is likely a more rigid corporate IT environment. We’ve had great success building omnichannel experiences for retailers in a test shopping environment that eventually get rolled out to the broader enterprise. As a digital innovation agency, we have always put a significant emphasis on designing, prototyping, and testing fast/early/often. Pop-Up Shops are the epitome of that philosophy in physical retail locations. When done well, wrapped in your brand promise, outfitted with applicable digital technology, and speedy, they can show you the path to success in all of your store locations. If you’re interested in creating a Pop-Up, drop us a line. We are currently working with multiple store design, architecture firms, and general contractors on building Pop-Ups around the country, and we’d love to help you do the same.